Leaflet for a Pye-tecnico’s Model W101C television receiver. Made in Australia, Oceania, 1956-1959. A colour printed leaflet for Pye-tecnico’s model W101C television receiver. The single page leaflet features an image of the television in a home setting. Below this are three images of the different versions of the television that are available. Details about the television are printed on the back of the leaflet. A colour printed leaflet for Pye-tecnico's model W101C television receiver. The single page leaflet features an image of the television in a home setting. Below this are three images of the different versions of the television that are available. Details about the television are printed on the back of the leaflet. 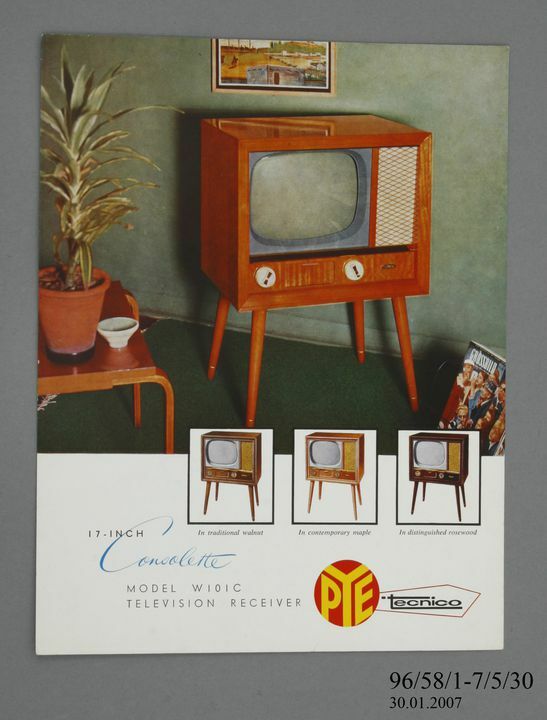 Text on the front of the leaflet reads '17-INCH / Consolette / MODEL W 101C / TELEVISION RECEIVER / PYE tecnio'.